Bought these in a bulk order for a very affordable price to promote my business with. The design come out perfect and it really helped me gain some sales. Thanks Custom Earth Promos. The look of these bookmarks is great. Affordable product that I highly recommend. Very great company to do business with. They are the best eco-friendly company around. Highly recommend checking out some of their products including this bookmark. Custom Earth Promos customer support team was awesome. They assisted me so I could find exactly what I needed. Will be a repeating customer for sure. 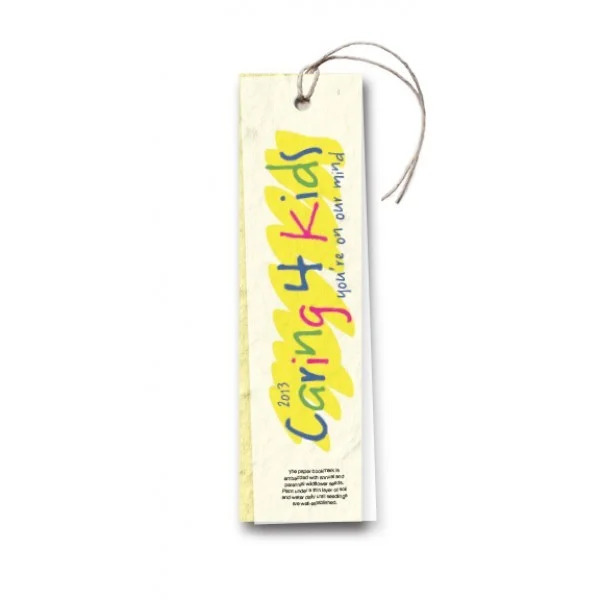 We give these bookmarks out at all our book fairs, the look great and are eco-friendly. Love these bookmarks! So happy with my order! Custom Earth Promos dedicated an enormous amount of time with me to achieve exactly what I needed! Thank you CEP! Customer Service was far superior than other companies. Very attentive and helpful so grateful for businesses like Custom Earth Promos! Great product and service my purchase was quick and easy thanks again C.E.P. I needed a last minute inexpensive eco-friendly promotional product and Custom Earth Promos made it so simple for me to get this done. Our students were thrilled with the finished product. Thanks for all your help! The meaning of an earth-friendly product at its finest. A bookmark that you can use and plant. Custom Earth Promos was very helpful in helping us work with our budget. This is just a wonderful bookmark. The quality of the print was really remarkable and they were delivered promptly. So cute for my students, love the quality and how easy the process was to design! Ordered these vellum value bookmarks and reviewed an unbelievable discount. Very classy and unique bookmarks. I like the fact that we could print photos on these bookmarks. So cool that when these bookmarks are thoroughly used, you can plant them. Love the idea. This lower cost alternative to Custom Earth Promos' classic seed paper & vellum bookmarks maintains the same eco-attractive, multi-dimensional and textured appeal. Vellum is opaque and includes a full-color customization on one side with our eco-friendly CMYK printing process, utilizing a 4-color proprietary printing process that is designed to guarantee no loss of germination. The custom imprinted vellum sits atop an equally sized 1.5" W x 5.5" H seed paper swatch, which creates a vibrant three-dimensional appeal to these waste reducing bookmarks. Customize your seed paper color to best complement the graphic imprinted on your vellum. We only use all-natural, soy-based pigments to color our high-yielding seed paper, spraying the paper with all natural dyes to achieve a stunning product that maintains all seed germination. The presentation is completed with an "earthy" hemp ribbon which loops through the top of vellum and seed paper to secure the custom graphic atop the seed paper for ultimate eco-elegance. 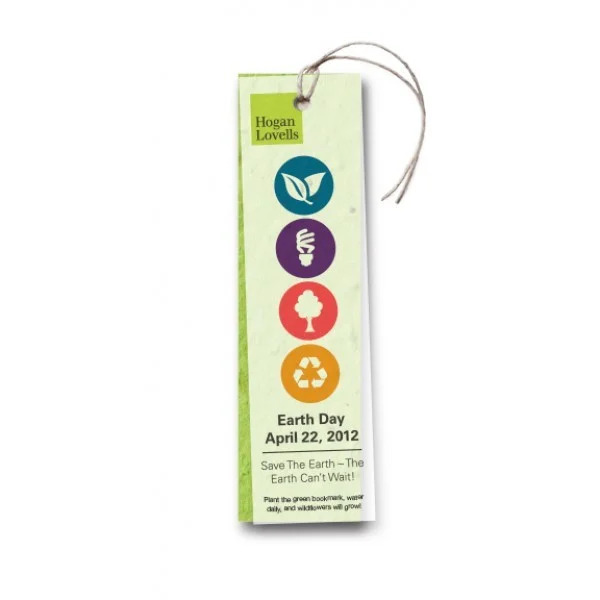 Customize your bookmarks to empower an environmentally conscious brand initiative, such as an announcement of a "green products" division or to promote an Earth Day sale for your business. By using a product that promotes sustainability and creates a connection with your customers that is rooted in environmental investment, add incredible value to your brand and position yourself to stay ahead of the game in your industry. With so many options for personalization, these powerful little advertising tools can effectively promote brands of virtually any industry with eco-attractive style. Invite customers to join you in a planet friendly process by planting their seed paper. 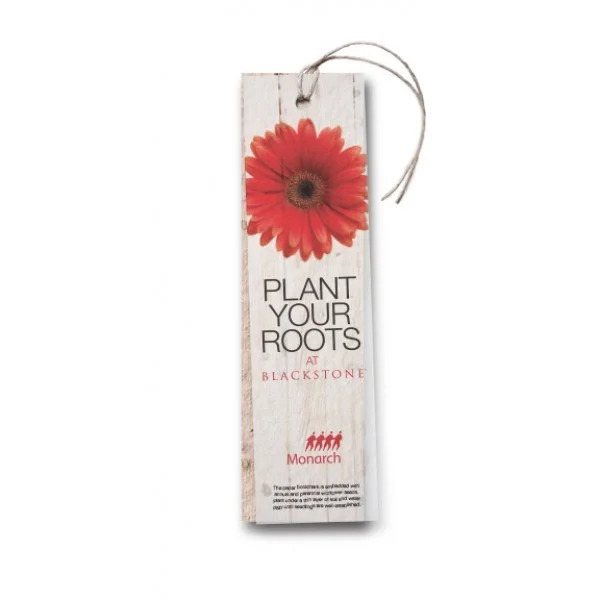 Soon after they've been planted, given proper water and care, the seed paper bookmarks will grow into a bold, blooming wildflower garden that serves as a beautiful reminder of your brand's eco-responsibility. Consumers are placing greater value and trust in brands that utilize waste reducing production methods and have an established commitment to environmental responsibility. It is vital for the succeeding businesses of tomorrow to convey eco-ethical initiatives and standards to customers. 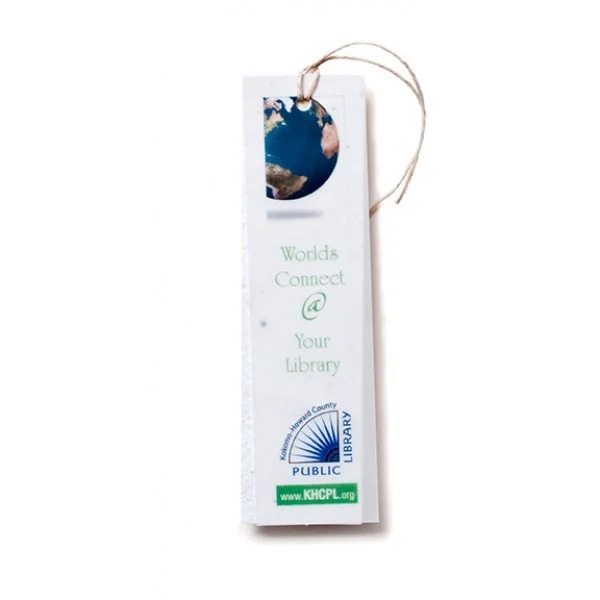 Take a proactive stance toward global sustainability that will win the admiration and appreciation of your customers and prospects with Seed Paper Vellum Value Bookmarks. Gain an advantage over the competition by investing in the eco-responsibility of your brand image. Custom Earth Promos invites you to work side by side with a member of our in-house design team to build a vibrant, eye-catching exclusive blueprint. With endless possibilities for customization, we guarantee to optimally capture and convey your message with aesthetics that match your brand ideals. Your custom graphic will be printed on premium vellum paper with full-color quality. You can even create a more personalized product by choosing a complementary color for your seed paper that makes the vellum graphic pop with eco-awesomeness. 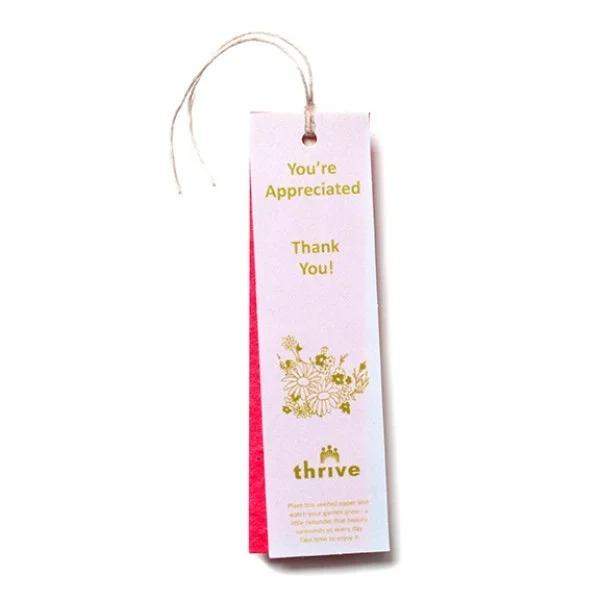 Completed with the "earthy" hemp ribbon, these powerful little promoters will prove to benefit your brand image, gain market share and increase long-term profitability! Custom Earth Promos' seed paper bookmarks uphold the standards of our all-natural founding philosophy with 100% post-consumer recycled paper, USDA-approved, non-GMO seeds with the highest germination rates possible. We use only white, undyed recycled paper to guarantee there is absolutely no potential threat to the environment or your customers. When adding color to the seed paper, we use only all-natural soy-based pigments. By manufacturing our high-performance seed paper in the USA at our 30 kW solar-powered facility, we eliminate all eco-impact. 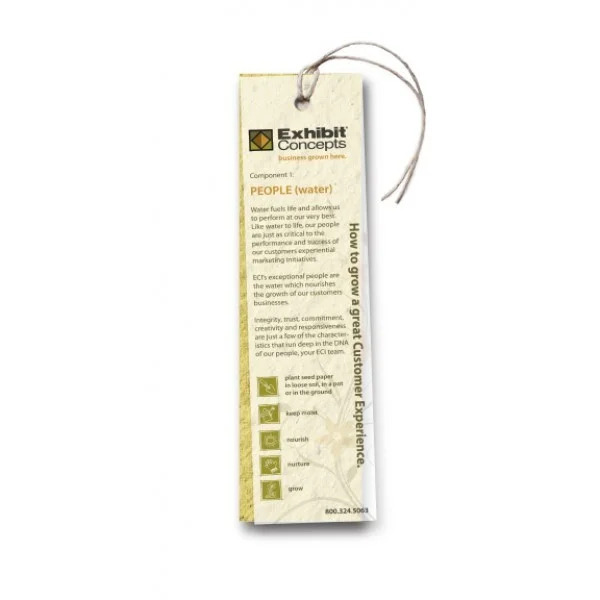 Seed Paper Vellum Value Bookmarks are an affordable, effective and eco-friendly product you'll be proud to give to customers as a testament to your brand's dedication to a sustainable future. You will work directly with our in-house design experts, building a design blueprint for your Seed Paper Vellum Value Bookmarks from scratch. We'll help you decide on the best custom graphic to imprint on the vellum and an optimal seed paper color to enhance the display of your graphic. We can even customize the Seed Mix used to promote a seasonal campaign or simply to add creative flair. Spread breast cancer awareness with our 'Hope Mix' of pink annuals and perennials, or add spooky style to a Halloween event invitation with our 'Pumpkin Seed Mix'. Talent is constantly in bloom here, with our team coming up with new ideas for specialty and seasonal mixes all year round. Be sure to ask your design expert about the special seed mixtures that we currently have in stock!